The calculator that wouldn't die. The HP-12C is HP's longest and best selling calculator. Though it has been followed by many newer models, with both more and less features this model continues to sell well. In fact an EduCALC catalog says of the HP 17BII (in bold type): "It's 15 times faster than the HP 12C, and displays more than 4 times as much information." And of the HP 19BII: "It's 15 times faster than the HP 12C, and displays more than 9 times as much information." In addition, both newer calculators can print via infrared to compact printers, have more memory, general purpose solvers, menus etc. It's a pure RPN calculator with no algebraic options to confuse the buyer or user. 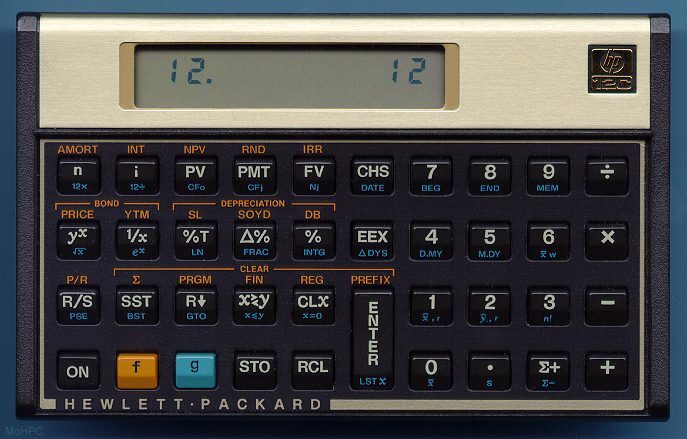 The HP-17B and 19B were algebraic calculators that were rather quickly replaced by BII versions with optional RPN. The average business buyer, is perhaps, less inclined to read the spec sheets and more inclined to buy based on word of mouth. It's good (and expensive) looking. Like all 10C series calculators, it has a nice solid built-like-a-brick feel that clamshell models can't quite match. It has become part of the well-dressed business uniform - easily distinguished from cheap calculators due to its layout. Perhaps it really does provide just the right functions in the right form factor at the right price. Improved action of SST and BST features. A much larger manual with useful chapters on real estate, lending, investing, leasing, savings and bonds. Tough construction: One HP-12C was used by a zoo keeper to calculate feed mixtures. The zoo keeper dropped the calculator and it was consumed by a hippopotamus. The calculator survived the hippo's digestive process as well as the washing that followed. Introduced: 1981 and still in production.